On the evening before a 4th of July birthday party, I didn't have enough sourdough starter to make a cake. I did, however, have a yummy and moist chocolate zucchini bread recipe and some spare cake pans. Not to mention, my favorite chocolate cream cheese frosting. Voila! This recipe was born gloriously into the world! Then, as the only logical thing to do, I adapted it to the Instant Pot. What was moist, became moister. And what was cute, became cuter in these muffin cups! With a yummy and moist chocolate zucchini bread recipe already under my belt, the only logical thing to do was adapt it to the Instant Pot (or any pressure cooker!). Say hello to Chocolate Zucchini Muffin Bites! Adapted from this recipe. Makes approximately 24 to 30 muffins. Combine eggs, sweetener, coconut oil, and vanilla extract in a medium-sized mixing bowl. Next, add cocoa powder to melted butter. Mix until it looks like a thick but smooth dark paste. Then, add chocolate mixture to egg mixture and stir well. Add flour, baking soda, sea salt, and cinnamon to the bowl. Fold in grated zucchini and chocolate chips. Then, add trivet and 1 cup of water to the inner pot of your Instant Pot or other pressure cooker. Cover with a glass lid to prevent evaporation. If using an electric cooker (such as the Instant Pot), put it on sauté so it can pre-heat. If using a stovetop cooker, turn on the burner to medium to begin pre-heat. Using a small cookie scoop, fill silicone muffin cups about 2/3 full. The 6-quart Instant Pot fits 16 muffin cups at a time. This means you'll have batter left over. Either pressure cook these muffins after the first batch is done, or cook them in the oven at the same time (*see oven adaptation below). Then, layer muffin cups inside inner pot of pressure cooker. Once bottom layer is full, cover with piece of parchment paper and piece of aluminum foil. Both should be cut in a circle to the size of the inner pot. Cover with a plate or another trivet. Then put the rest of the muffin cups inside to fill up the second layer. Try to keep all the muffin cups level! Again, cover with parchment paper and aluminum foil, then a plate. Cover the pressure cooker, checking that the seal and other parts are in good shape. If using an electric cooker, set to high for 8 minutes. If using a stovetop cooker, bring to low pressure and maintain for 8 minutes. When cooking time is over, if using an electric cooker, let it sit for 10 to 15 minutes while it depressurizes naturally. If using a stovetop cooker, remove from heat and let it sit for 10 to 15 minutes to depressurize naturally. Then, if any pressure remains, cover release valve with a towel and quick release. Next check for doneness with a toothpick. Finally, carefully unpack your lovely, moist chocolate-y muffins! For special occasions (or just for fun), top your pressure cooker muffins with this chocolate cream cheese frosting! *If you don't have a pressure cooker, this recipe is easily adapted for the oven! Bake muffins at 350 degrees Fahrenheit for 30 minutes (check earlier), and 8-inch square cake pans for 1 hour. How do pressure cookers work? Why is it so hot inside? Why do they cook food faster? And why do they yield more nutritious results? First, pressure cooking depends on water. As many of us know, water boils at 212 degrees Fahrenheit. It will always boil at 212 degrees Fahrenheit — unless the pressure or volume associated with the water changes. Well, volume is irrelevant here because the inside of a pressure cooker is a fixed space. So, as you can imagine, we'll focus on pressure! Pressure cookers begin by heating water to its boiling point. Picture little water molecules popping out of the liquid phase to bounce around your pressure cooker as a gas. As more and more of them fill that space, the pressure increases. Consequently, as the pressure increases, the temperature at which water boils increases, too. Think of the pressure cooker as divided into 2 sections — the liquid on bottom and the gas on top. In the liquid phase, water molecules are held together by fleeting but effective hydrogen bonds. You can imagine the molecules as holding hands. As they bump and jostle around, they let go and hold hands with other water molecules. On the other “hand” (hehe), gaseous water molecules float around in the air separately. They can collide with each other, but there's no hand-holding going on after they vaporize! To boil, water molecules must first become energized enough to break free of the bonds holding them in the liquid phase (source). Then they must also force their way into the air or other atmosphere (source). If there's low pressure, this is relatively easy. If there isn't much resistance (aka pressure) on the outside keeping water molecules in, they are much more likely to pop out. The steam, or gaseous water, cooks the food so effectively that it's actually faster than other methods — such as roasting and boiling! When steam condenses on the food's slightly cooler surface, it releases energy in the form of heat. This heat denatures proteins, melts fat, and otherwise completes the process of cooking. Looking For A Pressure Cooker? We use, love, and highly recommend the Instant Pot! Have you ever made muffins in the Instant Pot or pressure cooker? 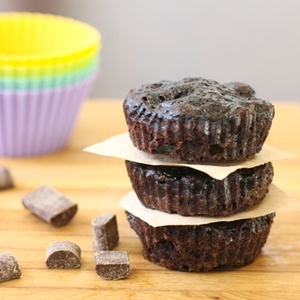 Will you try these Chocolate Zucchini Muffin Bites? Did you know the science behind pressure cooking? So I have a question. The reason I sought out and bought an Instant Pot, was because I wanted an appliance that didn’t contain questionable materials (ie non-stick coating, aluminum, etc). However, you add two sheets of aluminum foil to your cooking instructions. This clearly goes against the holistically minded way of thinking. Can you explain why you’d want to damage an otherwise clean recipe this way? Hello Heather! Thanks for bringing up your concern. We do put a piece of parchment paper underneath each piece of aluminum foil to keep the aluminum from directly touching the muffins. If you still are uncomfortable with compromising in this way, that’s just fine. 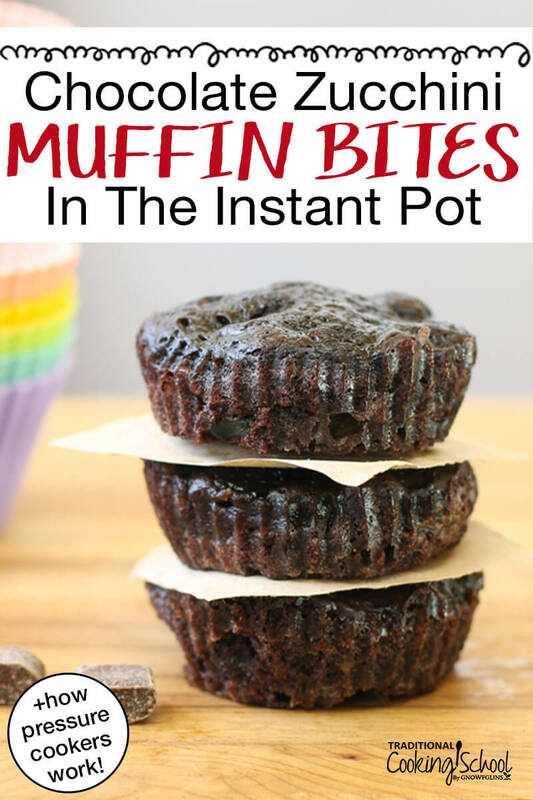 🙂 You could try using just the parchment paper and plate in between muffin layers, and see if that satisfactorily keeps excess moisture out of the muffins. I’d love to know how it works for you if you try it! I love my pressure cooker for many recipes, and this one sounds delicious, but I think in this case it sounds like it would be less work to just bake them in the oven…? Thanks for the recipe though! Hi Kelly! 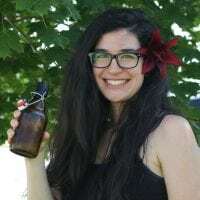 I find that making them in the pressure cooker comes in handy in several instances — when you’re pressed for time, when you’re cooking outside, when the oven is already full, or when you have to cook indoors but it’s too hot for the oven. Plus, adapting a muffin recipe to (in this case) the Instant Pot shows just how versatile a pressure cooker can be. 🙂 And the muffins do turn out with a slightly different, unique texture which is fun! How many eggs should have been listed? Can I use whole wheat pastry flour in place of the einkorn?